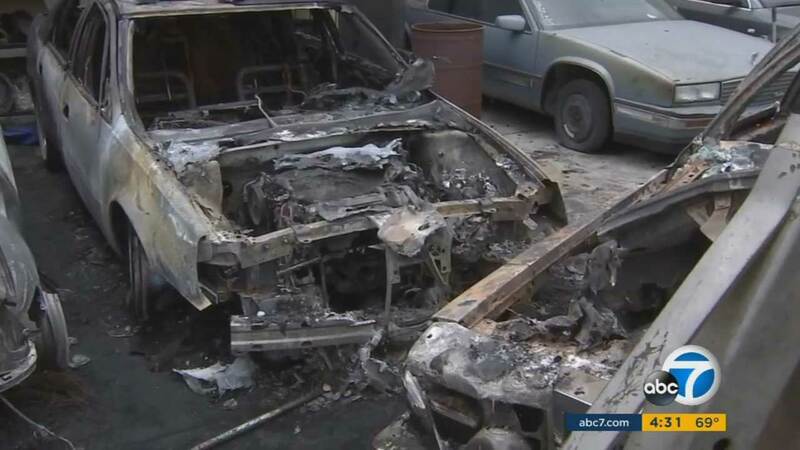 CRENSHAW DISTRICT, LOS ANGELES -- A suspect who set fire to an auto body repair shop in the Crenshaw District left behind a threatening message, according to officials. The Los Angeles Fire Department said it responded to the 3500 block of South Crenshaw Boulevard and found three cars on fire at about 3 a.m. on Tuesday. After quickly extinguishing the blaze, fire officials said they found threatening messages spray painted on the garage doors of Richard's Auto Repair. One said "Richard," and another said, "I will kill your family." "They said they would kill my family, me, but I don't have any enemy. Twenty-five years in business, this is the first time this has happened," said Richard Bermudez, owner of Richard's Auto Repair. Due to the threatening messages, the fire was being investigated as arson. "It's very disturbing. He's never caused any problems with any customers or given someone a reason to do something like this. In particularly threaten his life and his family's life, it doesn't make any kind of sense," said Richard Rodgers, a friend of Bermudez. While the three cars were declared a total loss, firefighters were able to stop the flames from spreading to the building. No one was injured during the fire, officials said.